My name is Estelle Sandford and I run a rattery based in Somerset, known as The Rats of Alpha Centauri. Alpha Centauri is my NFRS registered stud-name. Over the years I have kept and breed quite a few varieties of rats. 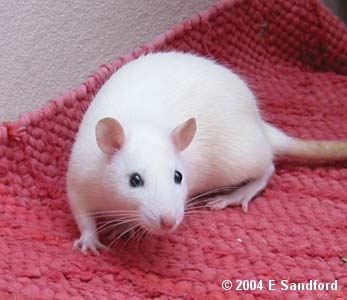 This section of my website is devoted to information about rats and their care. The articles are written by me unless otherwise indicated, but the links page will hopefully end up being a very comprehensive set of links to online rat related articles. If you have an article you wish to have added or linked or know of good articles that should be linked, please contact me. I am not a vet and have no veterinary qualifications, so any articles which detail treatments are based on my own opinions, personal experiences with my vet or from friends who have recommended treatments. In the cases where the article was not written by me it is the author's personal experiences or opinions which I support or agree with. Send mail to Estelle with questions or comments about this web site.